How to Reassess Your Chess has long been considered a modern classic. Now, this fourth edition - completely rewritten and featuring all new examples - takes Silmans groundbreaking concept of imbalances to a whole new level. 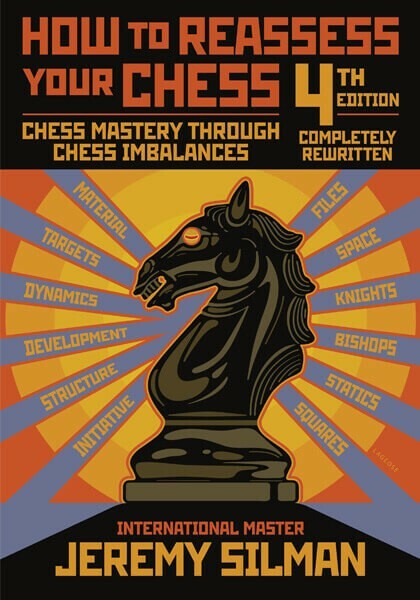 Designed for players in the 1400 to 2100 rating range and for teachers looking for a ready-made chess curriculum, the author shares a mind-expanding journey that takes the reader through imbalance-basics, ensures that every detail of all the imbalances are mastered, and leaves the player/lover of chess with something he always wanted but never believed he could achieve: a master-level positional foundation. A section on practical chess psychology (titled Psychological Meanderings) presents never-before-publishing ideas on psychological processes that hinder players of all levels, and gives easy-to-follow advice and techniques that will help anyone overcome these ubiquitous mental/emotional failings. Hundreds of games brought to life by instruction-rich prose, and stories that offer humor while highlighting various lessons, vividly illustrate all the books topics in a manner that is both personal and fun. Jeremy Silman is an International Master and a world-class teacher, writer, and player who has won the American Open, the National Open, and the U.S. Open. Considered by many to be the games preeminent instructive writer, he is the author of over thirty-six popular books, including Silmans Complete Endgame Course, How to Reassess Your Chess (universally accepted as a modern classic), The Amateurs Mind, The Complete Book of Chess Strategy, and The Reassess your Chess Workbook. fans of the game instruction, book reviews, theoretical articles, and details of his work in the creation of the chess scene in the movie Harry Potter and the Sorcerers Stone.